This post picks up where Part II left off: Gómez, now in his early 30s, was working in rural education in Northern Mexico. To start from the beginning, go to Part I. Around 1937, in Mexico City—perhaps returning from his cultural mission in the Sierra Tarahumara, Filiberto Gómez “chanced upon an American struggling to make himself understood with no better results than a red face and a bewildered Mexican. Gómez came to the rescue and the grateful American introduced himself as the Physical Director of Gustavus Adolphus College.” This “grateful American” was George Myrum, who had presided over the Minnesotan college’s ascent to athletic renown in the 1930s. Two Gustavus teams were “invited to tournaments in Mexico City” in the mid-1930s, which could explain why Myrum was in the Mexican capital. While in northern Mexico, Gómez had organized cultural programming to expose borderlands Mexicans to folkloric Mexican culture; in Minnesota he found a new audience for these sorts of performances. While a student at Gustavus, Gómez added to his income with a side job as a public speaker. 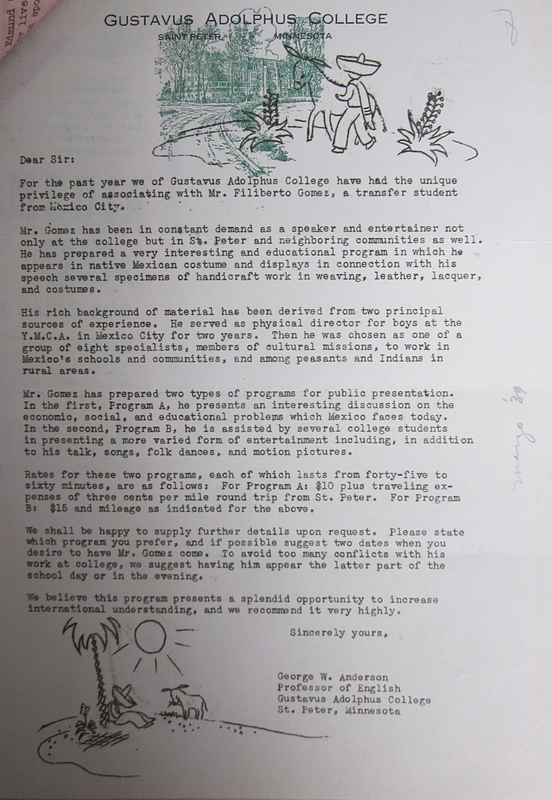 With a letter of introduction provided by an English professor, he promoted his services on college letterhead decorated with small cartoons of a Mexican peasant and his burro. Letter of introduction by George W. Anderson, c. 1938, in AGN, Presidentes—LC, 534.1/1059. “Condemned to die before a firing squad,” Tower Topics (University of Chicago newsletter), c. 1939, in Archivo General de la Nación, Presidentes—Lázaro Cárdenas, 534.1/1059. There is no evidence to suggest that Gómez’ declarations of patriotism were insincere. At the same time, his role as a cultural representative proved personally beneficial. Gómez converted his cultural capital as an elite Mexican to economic capital in the form of payments for his presentations and sales of his folkloric trinkets. When he helped organize a “Hispanic-Mexican International Festival” at the University of Chicago’s international house in February 1940, he even attracted the attention of the U.S. Spanish-language press. As San Antonio’s La Prensa reported, “countryman Don Filiberto Gómez” was responsible for teaching the young men and women the folkloric dances which they would perform “wearing the typical indigenous garb of our country.” Three presentations were scheduled to accommodate the high student interest in the festival. 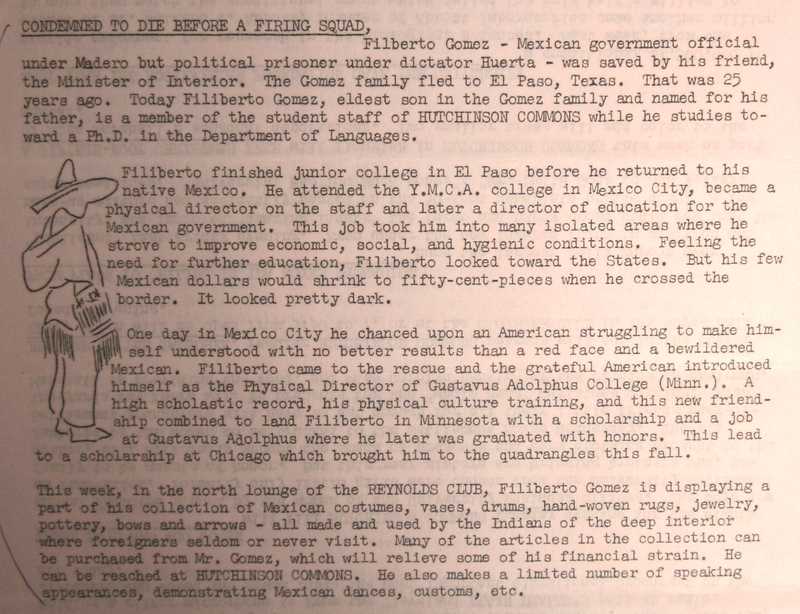 Yet in the Mexican press, Gómez was celebrated for embodying not national traditions, but modern progress: a 1939 newspaper profile of Gómez published in Torreón proclaimed satisfaction that this native of the Laguna region “has progressed in foreign lands as Filiberto has done.” They included a picture, partially obscured here by another page stapled on top. 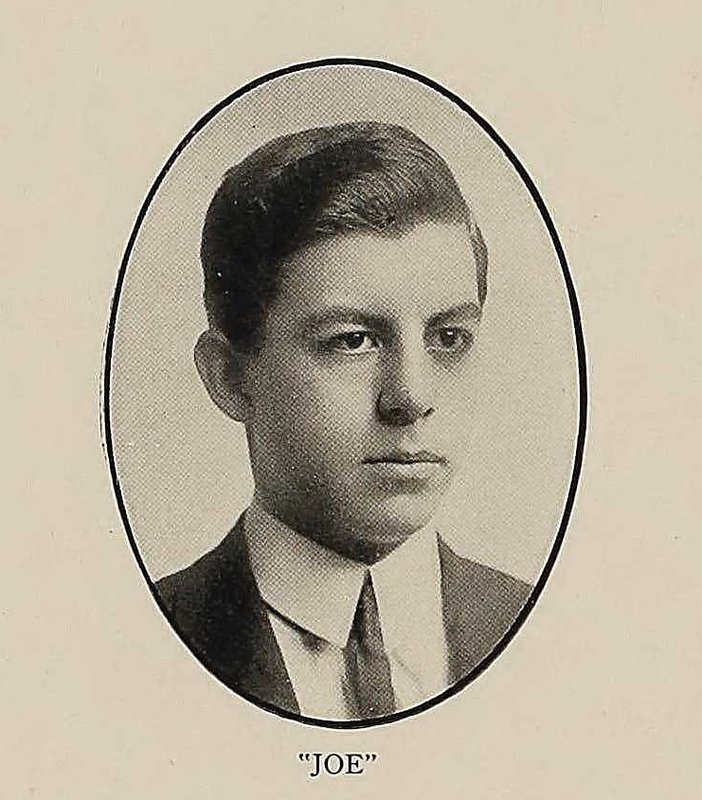 The article noted that the Mexican education system had lost a valuable talent when Gómez departed for study in the United States, and it stated that Gómez had been “honored” with scholarships at Gustavus and Chicago for “his merits.” Not mentioned in the profile was the fact that Gómez had grown up in El Paso, an aspect of his biography that would be entirely forgotten by the 1940s. It is not clear whether Gómez ever received a scholarship from the Mexican government. He left Chicago in 1941, perhaps because he could not cover his expenses despite his scholarship and side jobs. Yet despite this setback, Gómez managed to build a successful career in which people north and south of the border sought out his expertise as a Mexican intellectual, as a rural development specialist, and in particular, as an expert on the Tarahumara indigenous group living in the mountains of Chihuahua. There is more to this story. Check back soon. To read the first part of the story of Filiberto Gómez González, click here. Beginning in 1932, Filiberto Gómez resided in Mexico. Perhaps the Great Depression played a role in his decision to leave El Paso, which fell into economic crisis only in 1931. Half a million Mexicans in the United States repatriated or were deported in the first years of the Depression, and among them probably several thousand people of Mexican origin in El Paso crossed into Mexico during the Depression. But given the apparent social ascent of the Gómez family in these same years, Gómez may have had personal, rather than economic motivations to return to Mexico. His first stop was the YMCA College in Mexico City, which he attended around 1932. After completing his studies, he “became a physical director on the staff” until about 1935. It is possible that his training and work in physical education also exposed him to the YMCA’s private-led efforts in rural development, an interest he would soon develop; and he might have met prominent Mexican officials who could connect him with a government job, for the YMCA counted many allies among the country’s ruling class. Yet even while exercising his Mexican citizenship as a government employee, Gómez looked for ways to stay connected to the other side of the border. In 1935, he published two articles in El Paso’s Spanish-language paper El Continental in 1935 on the folkloric traditions of Holland and the Soviet Union as part of promotion for a festival he was organizing in Ciudad Juárez. The “Bronze Race Festival” (Festival “Raza de Bronce”) was meant to fundraise for a gymnasium and sports facilities in Juárez. Combining his athletic interests and abilities with nationalist sentiment and community activity, Gómez’ fundraiser was typical of the sorts of cultural activities he would organize during the coming decades. 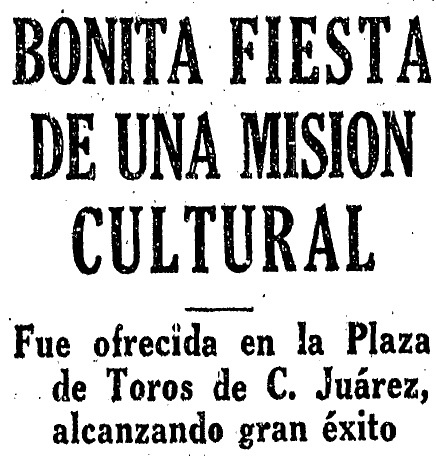 From the article, “Bonita Fiesta De Una Mision Cultural Fue ofrecida en la Plaza de Toros,” La Prensa, San Antonio, June 26, 1936, p. 5. In 1936, as part of his work with the government, he collaborated in a touring exhibition of regional dances in Ciudad Juárez intended for the Mexican communities of the border region. As he told a reporter for El Continental of El Paso, this cultural event would “evoke remembrances and welcome memories for our Mexican brothers [hermanos de raza] living north of the Río Bravo.” Gómez referenced the fraternal bonds uniting all Mexicans, in Mexico and in the United States, but he identifies himself with the Mexicans “at home.” Omitted entirely is the fact that Gómez’ own siblings lived “north of the Río Bravo.” These articles, the earliest documents that captured Gómez’ own voice, foreshadow a silence in the rest of Gómez’ public statements: he did not speak of his childhood in El Paso or his family in the United States. However, Gómez’ next career move was to pursue his education not in Mexico, but in the United States. How did Gómez end up in Minnesota at Gustavus Adolphus? Check back soon for the next part of the story. How did a Mexican boy from Chihuahua end up at a small Lutheran college in Minnesota? Like the Mexican students in Tennessee mentioned in the last post, Filiberto Gómez González’ college education took him to a remote corner of the United States. Known as “Chito” to his friends, Filiberto Gómez González (1904-1999) enjoyed renown for several talents during his life: he was a basketball star, physical education teacher, a specialist in the Tarahumaras, and an expert in rural development. While his story has mostly been forgotten, traces of his work and his journeys abound. This post tells part of the story of Gómez’ life, and later posts will complete the tale. At the end of the post, I’ve listed some sources used to write the section. If you’re interested in a more formal version of the biography with full citations, contact me. Filiberto Gómez González was born on November 30, 1904 in the town of Villa de Allende, Chihuahua. Gómez’ father (also named Filiberto) worked as a telegrapher operator. Both Filiberto Sr. and his wife Virginia, Gómez’ mother, probably had at least several years of formal education. In July 1912, Filiberto Gómez migrated with his family—his mother and father, his paternal aunt, and his five siblings—to El Paso. The family was classified as refugees by the immigration officer who inspected them. Many other families from Chihuahua fled the Revolution and settled El Paso during this decade, when the city’s population nearly doubled, reaching 77,560 in 1920. Many of these Mexican immigrants were children, and Mexican children soon came to form the largest group in the El Paso school population. Though many of the refugees were destitute, some Mexican families belonged to the elite or the middle class, like Gómez’ family. The Gómez family spent their first years in El Paso living in the neighborhood Chihuahuita or South El Paso, the city’s main Mexican barrio and the place where most new arrivals from Mexico first settled. Soon after moving to El Paso, Filiberto Sr. became the proprietor of a grocery store. The Gómez family stayed in Chihuahuita until at least 1924. Conditions in Chihuahuita were notoriously unsanitary and unsafe. As a 1915 housing report noted, “Probably in no place in the Untied States could such crude, beastly, primitive conditions be found as exist in Chihuahuita,” and public outcry did lead to city and charitable interventions. But unlike many recent immigrants in Chihuahuita, no one in the Gómez family worked in low-paying railroad or agricultural jobs. As the owner of a grocery store, Gómez’ father belonged to a relatively small group of the Mexican El Paso labor force classified as “low white collar.” While the family was hardly wealthy, Filiberto Sr.’s work differentiated them from the poorest Mexicans in their neighborhood. To be sure, Gómez children’s early school experiences may have been marked by the difficulty of adapting to English and the humiliation of studying alongside much younger children. While the language barrier affected children of varying social class, families like the Gómez family at least had the wherewithal to keep their children in school. Gómez may have become familiar with the Young Men’s Christian Association (YMCA) during his youth: a “Mexican YMCA” was founded in 1914, located at 517 South Florence Street, less than two blocks from the Gómez family store in Chihuahuita. As Yolanda Leyva notes, “El Paso’s youth were urged to go to the YMCA, where their bodies and energy would be rejuvenated rather than destroyed” by the juvenile delinquency thought endemic to South El Paso and its young Mexican inhabitants. Perhaps relying upon skills he developed at the YMCA, Gómez won a boxing championship in El Paso at some point in his youth. Later biographical sketches report that Filiberto Gómez attended high school and junior college in El Paso; though sources do not say where, he may have attended El Paso High School, about a mile and a half from the family home on South Campbell Street. In 1924, when Gómez was 19 years old, a border identification card (shown above) issued to him listed his occupation as student. Yet as the border crossing card suggests, it seems that Gómez ventured beyond El Paso to points south and actually resided in Mexico when he was a young man. 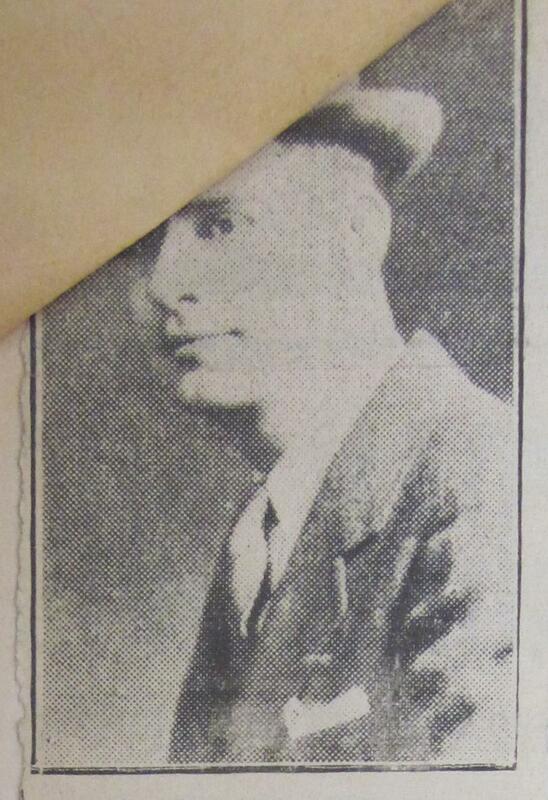 However, when he registered for the draft in 1942, Gómez listed El Paso as his place of residence from 1912 to 1932. Inconsistencies with dates and locations could have simply been errors, or Gómez may have had his reasons for omitting some of the time he spent in Mexico. In any case, Gómez still was closely tied to his family’s El Paso homestead in the 1920s and 1930s. There were clear signs of the Gómez family’s upward mobility. By 1928, the family had purchased a house worth some $5000; this home would remain in the family until at least 1972. The home was located in Sunset Heights, originally an Anglo neighborhood that had been settled by elite Mexican exiles during the 1910s, though by the 1920s many more Mexican families had moved to the area. Two of Gómez’ sisters worked as public schoolteachers, placing them in the highest socioeconomic group of high white collar professionals who were just 1.8 percent of the Mexican El Paso labor force in 1930. Gómez himself worked as a physical education teacher. 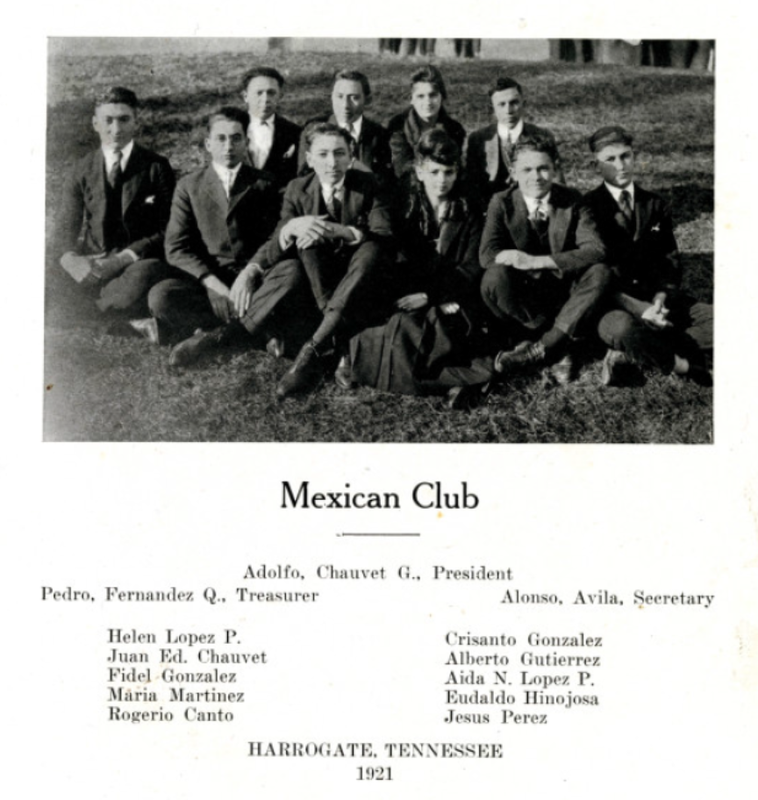 Through marriage, the Gómez family had also connected to the elite strata of Mexicans in the United States: Gómez’ older sister, Virginia, married Alfredo Baños, Jr., son of the Mexican consul in Baltimore in 1930. Check back for another post to tell the story of the next phase of Gómez’ life! García, Mario T. Desert Immigrants: The Mexicans of El Paso, 1880-1920. New Haven: Yale University Press, 1981. Leyva, Yolanda Chávez. “‘Qué Son Los Niños?’: Mexican Children along the United States-Mexico Border, 1880-1930.” Ph.D. diss., University of Arizona, 1999. Martínez, Oscar J. Border Boom Town : Ciudad Juárez since 1848. Austin: University of Texas Press, 1978.